Triathlon gets pulses racing in Fishguard and Goodwick. After a long hot spell, the athletes must have given a great sigh of relief at the overcast start. Nothing to dampen the enthusiasm of LOCAL support though, as testified to by the number of cars filling every available flat spot. The enthusiastic MC rallied the crowds with her constant exhortation accompanied by heavy beat music, the colourful flags, banners and sets, the scene was set for a truly entertaining event. 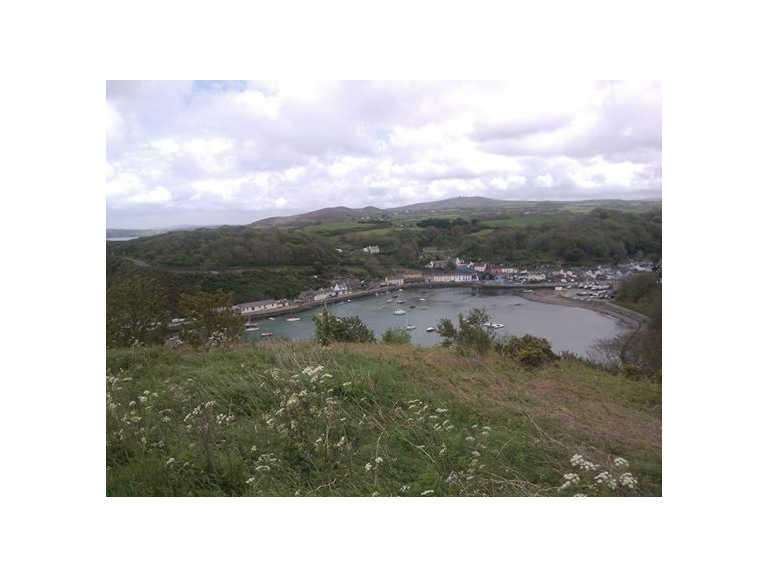 It was enthralling to see Goodwick seafront alive, vibrant and buzzing with people. I attended a BBC Roadshow some years ago, and this had the feel and professionalism of that show. The constant commentary kept us up to speed on events in the race that were not immediately near to us. So it felt like there were lots of events going on at the same time. I believe that 3 contestants missed the cut off in the swim last year, so as the time counted down towards the end, there were still 10 left in the water. Led by the MC, everyone got into the unifying groove to urge them on. The transition proved to be the most popular vantage point, as the change from swim to cycle had lots going on. My heart went out to one man, who having completed the gruelling swim limped back, after a successful transition, with front wheel in hand. When you are up close to these athletes, you realise just how fit they are. The result of true dedication to their sport. If ever there was an advert for attending a real life event, this was it. The atmosphere was tangible and the cheering pulled you in as part and parcel of everything that was going on. If you didn’t know any LOCAL contestants, then you could be non-partisan and cheer for everyone else. So, apart from the spectacle, what other benefits do events like these bring to our community? A visit to any of the LOCAL shops, in the vicinity, would answer your question. While further afield, groups of cyclists took to the roads, complete with all the gear, and at least looking the part. Another side benefit, has to be this raising in profile, of our need to get active, when so much is delivered to us on a plate. Athletic events spur us on, but if they turn out to be New Year Resolutions so what, just as long as there is a regular reminder boost to spur us on again. Eventually, anything we do regularly, becomes a habit. With organised events, like these, on a regular basis throughout the summer, just think how much more attractive our little LOCAL area could become to potential visitors. But for now, lets celebrate what we have got, and also achieved, as we acknowledge the dedication, sacrifice and effort of all involved, athletes, organisers and stewards alike. People who put themselves out so that we, the public, can enjoy ourselves.